October 7, 2016 By This post may contain affiliate links. Do you think you can handle eating a Bleeding PJ&J Brain? 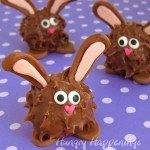 I guess if you thought these treats were totally gross you’d probably have clicked away by now. 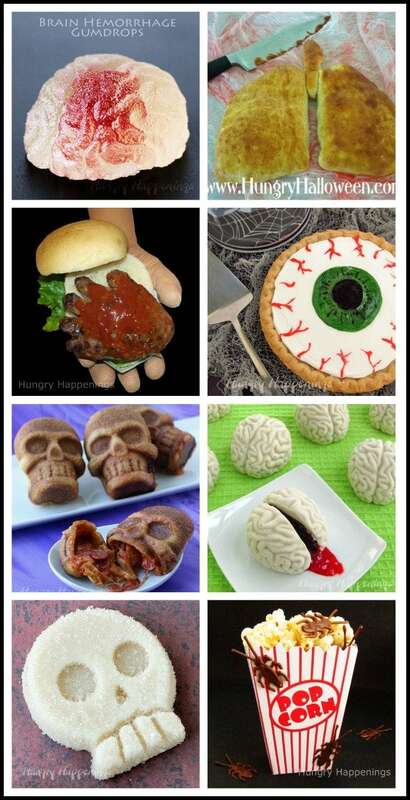 So for all of you who decided you just had to see how to make your own bleeding candy brains, let’s get started. If you’ve been following Hungry Happenings for a long time, you might recognize the image above. 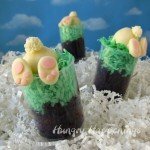 In 2012 I created these Cake Ball Brains to serve at our zombie themed Halloween party. This year I wanted to create a new version with even more dripping “blood” inside so I chose to fill the candy brains with my super easy 3 ingredient peanut butter fudge and lots of oozing jelly. Well, actually I used raspberry preserves because that is what I had in my pantry, but any jam, jelly, or preserves will work as long as you strain out the seeds and chunks of fruit. 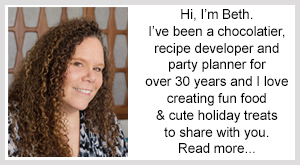 The peanut butter fudge is one of my favorite recipes of all time. It’s made using candy melts, peanut butter chips and peanut butter. It’s liquid when it’s first made but it firms up into a lovely creamy fudge It’s perfect for this project because you can pour it into the brain molds easily. Each of the brains is made using a blend of pink and white candy melts. When I made the cake ball brains I made them light gray. I thought they looked like they’d be appetizing for a zombie. For these new candy brains, I decided to make them a more realistic color. Below is a video quickly showing the process of creating the brains using candy melts. 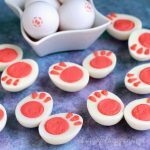 If you’d like to see detailed instructions for making the candy shells for these brains, go over to my Cake Ball Brains recipe to see the step-by-step tutorial. 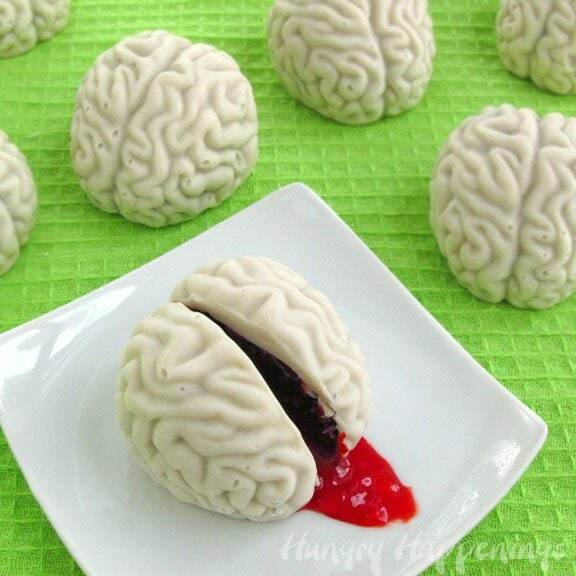 To make these candy brains you will need to get three silicone brain molds. I used a Fred and Friends Brain Freeze mold, but there are a lot of silicone brain molds available on Amazon and they should be very similar. I used Dickinson’s Raspberry Preserves and Jiff Peanut Butter in my recipe. I highly recommend both. 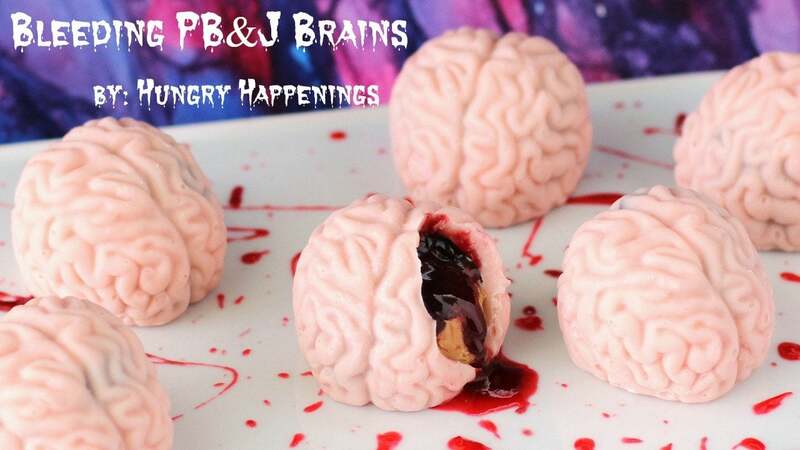 You can find all the items you need to make these Bleeding PB&J Brains on amazon (affiliate links). 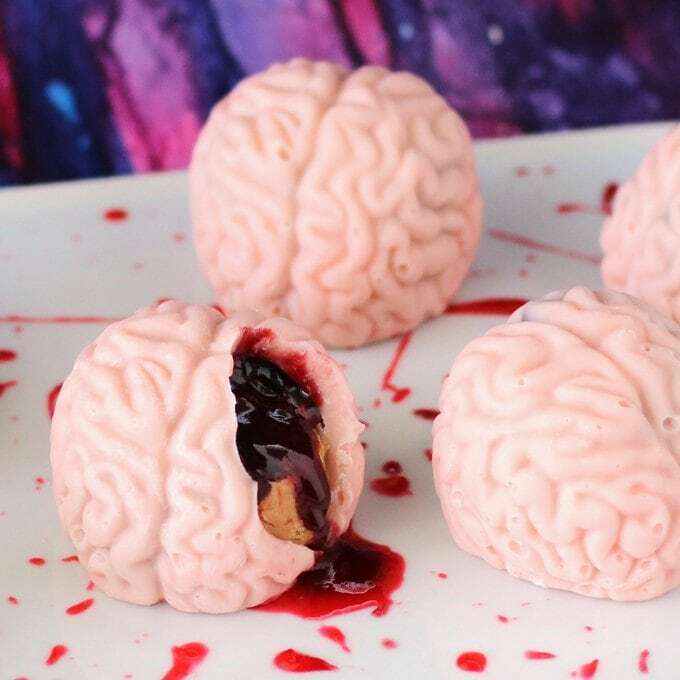 These peanut butter fudge and jelly filled candy brains are perfect for your halloween party. 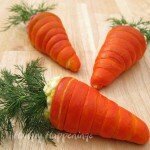 They are so delicious and will spook everyone! *Use regular pink candy melts not bright pink candy melts. Pour white and pink candy melts into a microwave safe bowl. Heat for three 30 second increments on high power, stirring well after each. If needed heat for 10 second increments on high power, stirring after each until melted. Spoon 1 tablespoon of candy coating into each brain cavity reserving the remaining candy to top off the brains once filled. Brush the candy around the entire interior of the mold. Freeze for 3-5 minutes just until the candy hardens. Stir the preserves until very runny, adding a drop or so of water if needed. If needed, you can warm your jelly, just be sure it's only slightly warm when you pour it into the brain. Spoon 1 tablespoon into each brain. Combine the 4 ounces of white candy melts with the peanut butter chips in a microwave safe bowl. Heat on high power for two 30 second increments, stirring after each. Heat for 15 second increments on high power, stirring after each until melted. Allow the fudge to cool for 5 minutes. Pour a heaping tablespoonful into each brain on top of the jelly, filling to 1/8th of an inch from the edge of the mold. Freeze the brains for 10 minutes. Re-heat the pinkish candy coating in the microwave for 10 second bursts at high power, stirring after each until melted. Spoon about a teaspoon of the candy coating on top of each brain, over the peanut butter fudge layer. 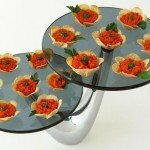 Smooth it out by gently tapping the mold on the table. 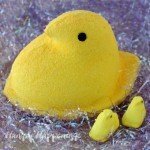 Wipe off any candy coating on the top edge of the brain mold. Freeze for about 5 minutes until the candy hardens. Remove from freezer and un-mold by peeling away the silicone mold from the brains. See a step-by-step tutorial on painting the candy coating into the brain molds here – Cake Ball Brains. Don’t leave your brains in the freezer for too long or they can crack or develop condensation on the outside. If you want less oozing blood in your brains, you can use less jelly and increase the peanut butter fudge recipe so you can add more of that instead. If you can handle it, scroll down to see something super gross! 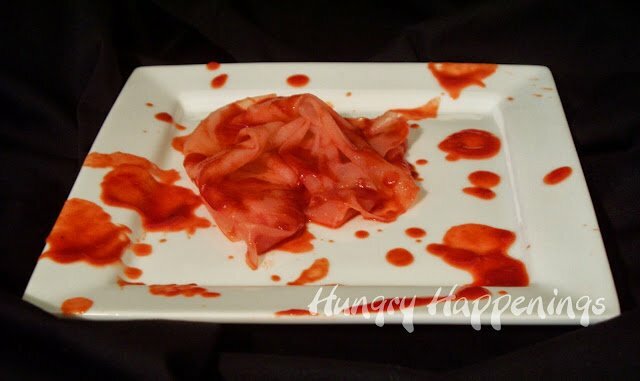 I made this skin and blood dish using spring roll wrappers and strained spaghetti sauce for our Dead Man’s Diner Party. 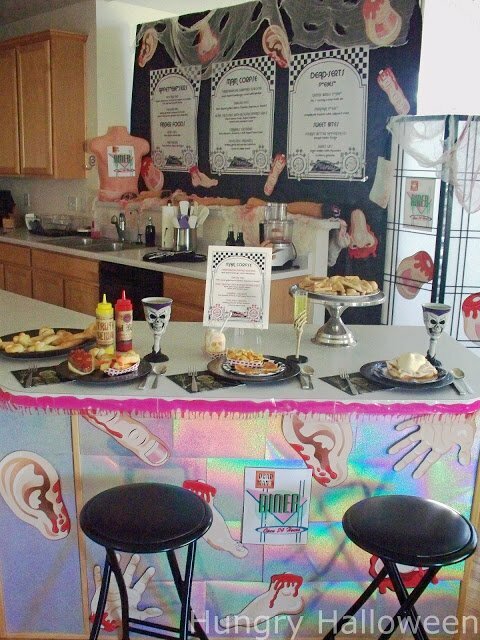 I also made bone calzones, grilled feet and bone chips, hand burgers and finger fries, feet-loaf, toe jam sundaes, stubbed toe subs, and open face sandwiches. 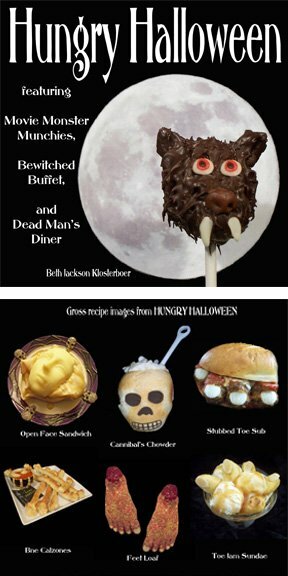 All these recipes are in the book I published back in 2010, called Hungry Halloween.